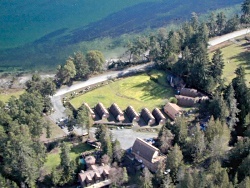 Salt Springs Spa Resort is located only minutes away from the famous Saturday market, excellent Gulf Islands living, fine dining, golf, kayak, hiking, sailing, cycling, live music and BC's famous fishing. long strolls and quiet talks are the preferred method of communication. Skilled therapists and estheticians at our Spa offer a variety of treatments to soothe, relax and revitalize our guest's tired bodies. Whether it's a seaweed wrap collected from the shores of Vancouver Island or a mineral bath full of Salt Spring Spa's Healing Mineral waters, spa-goers are sure to be impressed. "Everyone was great, friendly, helpful and concerned about our well-being. We really enjoyed ourselves and we feel pampered and totally relaxed. We'll definitely be back - thanks so much." "We've stayed at a lot of hotels and resorts and I'd have to say this one is my new favourite. We will definitely be back!" "Steamed, flowered, brushed & massaged! It was great! Best Spa we've been to, better than Banff Springs." 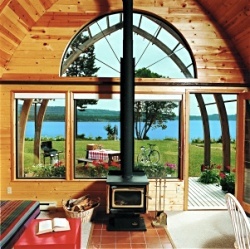 Experience the good life in one of our homey Gothic Arch Chalets. Each of our chalets features a full kitchen with kitchenware & microwave, a cozy wood-burning fireplace, gas BBQ, sunroof and ocean view or forest view sundeck. 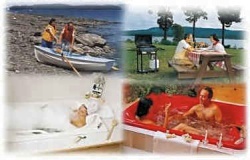 You'll also enjoy your own oversized two-person hydro-jet spa tub fed from the spa's healing mineral spring waters so you can soak your knotted muscles and aching joints. Relax in the clean air and tranquil surroundings of Salt Springs Spa Resort on beautiful Salt Spring Island in BC's Gulf Islands -- experience an unforgettable health resort vacation or romantic weekend getaway. The west coast climate of British Columbia offers an ideal setting for spa-goers, nature lovers, and anyone yearning to escape from the bustle of city life. The serene atmosphere and pristine beauty of this natural BC setting ensures that your island getaway, romantic escapade or health retreat will be a memorable one. Taste the Gulf Islands lifestyle; it's a life you will not want to leave!